who was also crowned Dairy Queen at Agri-Expo Livestock for three consecutive years (2014 to 2016). dairy breeder at Livestock’s dairy show. The National Championships of the SA Holstein Breeders’ Society will take place from Thursday 11 until Saturday 13 October at Agri-Expo Livestock at Sandringham outside Stellenbosch. It is the 20th time that the championships are presented, but only for the third time in the Western Cape, in the 106 years of the society’s existence. The first championships were held at the Rand Show in Johannesburg in 1949. SA Holstein’s Annual General Meeting will take place on Wednesday 10 October, followed by the National Championships from Thursday 11 until Saturday 13 October. Livestock is especially sought after for its dairy interbreed show, supported by the three largest dairy breeds, the Holstein, Ayrshire and Jersey breeders’ societies. 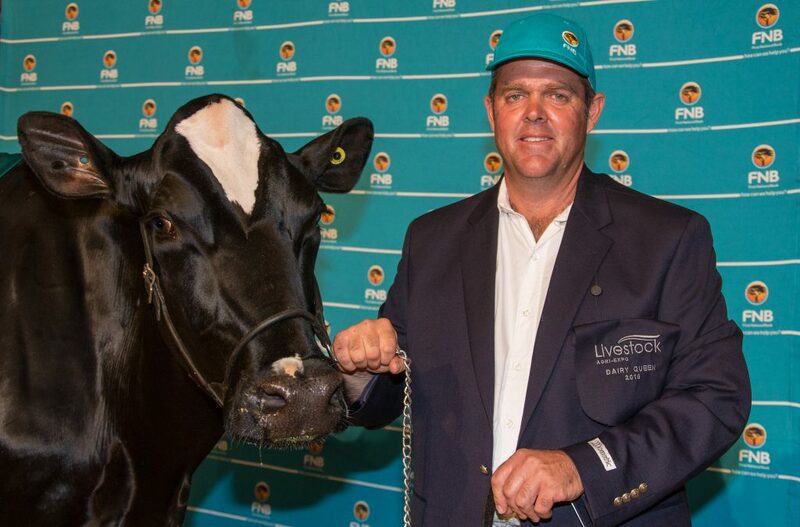 The crowning of the FNB Dairy Queen on Saturday 13 October is the highest honour awarded to a dairy breeder. A Holstein cow, Milagro Sexie 13140 from Andrew Masterson, well-known breeder of the Eastern Cape, carried this crown last year. A highlight at this year’s dairy show is the participation of the international Holstein judge, Brian Carscadden of Canada. Carscadden has already judged in more than 28 countries, including at national shows in 18 countries. Carscadden’s participation is made possible by Semex South Africa and the Holstein Breeder Society of Canada. Agri-Expo Livestock is open to the public daily from 08:00 to 18:00 from Thursday 11 until Saturday 13 October. The programme includes beef cattle interbreed championships, a regional youth show, sheepdog and horse auctions, a free schools’ programme, beef cattle and dairy goat information days and the Groot Plaasproe food stalls. Visit www.livestock.org.za for the full Livestock program. Tickets are available at Computicket and the gate at R100 for adults and R30 for scholars (free on Thursday and Friday). Access for children under six years is free. Pensioners pay only R50 on Thursday and Friday. For more information, contact Agri-Expo at 021-975 4440 or admin@agriexpo.co.za. The SA Holstein cattle breeders association is the largest dairy breed association in South Africa. Holsteins produces most of the milk consumed by the public and is also the breed that creates the most work. The Holstein breed is the world’s largest dairy cow breed with nearly 30 million cows recorded in thirty countries. The advantage for the South African dairy manufacturer is that the very best animals from a very large population can be selected with major improvements in genetics over fairly short periods of time. The average Holstein cow has an increased milk production of more than 12 000 kg compared with 50 years ago. According to SA Holstein, they are the only organisation officially recognised by the World Holstein Friesian Federation (WHFF) and the Animal Improvement Act for the issue of pedigrees of registered Holstein in South Africa. SA Holstein is also the only breeders’ association that owns copyright on their pedigrees (since 1946).